Cant wait to play D3! I will be playing a Barbarian as my main character when the game starts so please look me up in game. Love this podcast. And the community in general. Im a grad student currently out of work so ill be playing a lot! Get at me! I enjoy the podcast and have been listening since the beginning (I’ve stayed a while and listened). I like the different perspectives and look forward to learning more about things I should check out in game from future cast. I’ll be playing a good amount weeknights and weekends randomly CST USA. Since a good group of competent people that know each other will not only be the most fun way, but also most efficient way to play, I would like to meet up with some good equal minded people to have some fun. Hit me up in game, I have vent and will get on mumble if that’s preferred. I don’t know what my main will be yet but I will eventually have a 60 of everything. Love your podcast! I look forward to it every week! Thanks for building such a wonderful community! Thanks for the excellent D3 podcast. You guys are so fun and informative!!! I’d love to be a part of the community. I look forward to slaying some demons with you guys!!!! Love the show, keep it up! Listen to one show and have been hooked! Great to hear the experiences of everyone so i can go… Yup.. I had the same problem! Looking forward to playing with everyone. If anyone needs help or wants to do runs I have a 60 monk, a MF/GF wizard in nightmare and the nightmarish staff of herding. Hi, I like listening to your podcast. It gets me by when Im at work and can’t play Diablo. Im a lvl 60 barbarian and I think it would be cool to team up with some of u guys in game. Add me if you wish to play with me in US server. Saw the Nevik’s tweet about the game night for tonight. Hope to be there. Hi, this is Tensor from Diablofans. Just wanted to drop by and say hello. Hello SS team – I would love to add my D3 battle tag information for your list of listeners above. Hi folks! Very Informative. GameNight! woot! Anyone want to help me get a hellfire ring?? look at all those battle tags id like to c them grow!!! 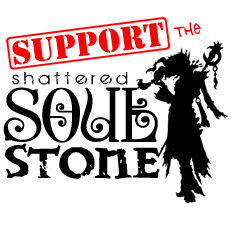 come join the new forumz now at shatteredsoulstone.createaforum.com!!!!!! Hello all, finally got onto the site…listening since day one and have been playing Diablo since Diablo 1 launch…hope to see you guys online. Hope to play with some of you guys soon. Love your podcast. Been listening to it for a while now. Hope to play with some of you soon. Listened to the podcast for the first time today and I really enjoyed it. It’s good to hear something from the internet about D3 that isn’t played out criticisms or comparisons to D2. Love the podcast. It’s great to hear about the game without all the normal drama you hear about on other casts and forums. You all are well balanced and cool. Great site too. Look forward to playing. Hey guys, you can throw my twitter up here too… @scanline75. Great podcast! Found you on Twitter, subscribed to the ‘cast and now registered on the forums. Keep ’em coming! Please add me to the list of listeners above. I’m listening to your podcast on my way too and from work. Nice pass time, helps me with the endless traffic jams. Keep up the nice podcasts, sounds like a great community! Ill do HC or SC I have endgame guys on both add me ill play gotta level them paragons. Please update my listing above with my twitter account, thanks!!! Hi guys My battletags Fryingtuck#2318, I am from the uk Northeast England. Main on the eu servers but I have roll a character on the us servers recently. Hey there! A long fan of Shattered Soulstone. I used to play in Korea so I couldn’t join you guys. However, I moved to the U.S. and bought the U.S. version. My battle tag is Atramentum13#1598. It would be nice to play with the fans of this podcast! Hi! A new listener appears. Love the show and keep up the great work! New listener to this amazing Pod Cast I have learned heaps all ready! I have been listening to this podcast for about 2 months now, and am up to episode 37. I know I have a long way to go, but continue to chug along. Great show, great hosts, and valuable information. Thanks to everyone! I am including my battletag in hopes that it gets added to the list!